Jesus…and bunnies and eggs? Oh my! This blog has Easter crafts for families on either side of the bunny debate. But first, He comes first. Let’s get our Jesus craft fix. My son made this craft at church when he was three years old. I picked him up from Kidzone, and being that moms are pack mules, I held the craft along with my one-year-old daughter, a diaper bag, and the rest of his stuff. With no hands to stop the baby, she was on the mini-Oreo like a fly on a rib roast. Down the hatch it went. My son had an epic meltdown along with a record timeout. Just like with my family, this Easter craft can help make fun memories, especially if you have little ones. And the best part is this is a simple craft that is made with yummy treats! Affix label to the toothpick or glue the banner on the toothpick. Color the frosting and frost the cracker. Stand the mini-doughnut and mini-cookie in the frosting. Stick the toothpick in the mini-doughnut. Encourage the kid(s) to admire the treat and absorb the message before devouring. Feel free to shake up this craft. I prefer chocolate graham crackers. You can use a nut butter, Nutella, or marshmallow fluff instead of frosting. And if you are not that into mini-doughnuts (like me! ), you can always cut down a Nabisco Pinwheel to function as a tomb. This is one of the cheapest Easter crafts. It is adapted from Faithful Little Hands. Everything, including the clear contact paper, came from the Dollar Tree. The kids and I used beat-up tissue paper that I was hoarding. So, check your supply closet before making a Target run! Use a smaller plate or bowl from your kitchen to trace a circle on the back of the paper plate. Cut a circle from the center of a paper plate to make a frame. 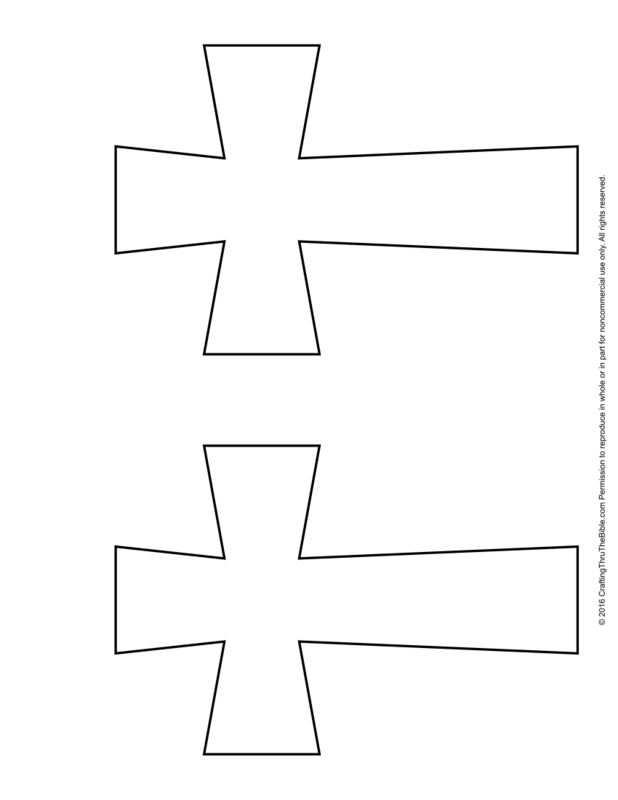 Freehand or trace a cross from the circle and cut. Remove the backing from a sheet of contact paper and adhere the cross facedown to the center. Place tissue paper scraps around the cross, fully covering the empty spaces. Seal your work by placing the other piece of contact paper over the back. Trim the sealed piece to a round shape that is about a half-inch or so wider than the frame opening. Tape the finished suncatcher to the back of the frame and display. You can skip the paper plates altogether and use construction paper or cardstock. Make it square if you wish. You can also use parchment paper and glue instead of contact paper. My son prefers contact paper because it’s quicker. I prefer parchment paper and glue for two reasons: These mediums keep him busier longer, and separating the contact paper from its backing makes me behave in a way that Jesus wouldn’t, which totally defeats the purpose of the craft. Whether the Easter Bunny is included in your holiday or not, this craft is still fun because the kids have toys when they’re done. This can simply be a cute bunny craft. Fill the sock with rice until you get to the ankle area. Tie off the sock with a rubber band. Form the neck just below the heel area of the sock by tying on another rubber band. Cut the ears to desired length and shape. Decorate the face and body as desired. Life is messy enough, so be sure your bunnies are securely sealed. If you don’t have any mismatched or old socks, my favorite craft store, the Dollar Tree, sells plain white two packs. Seriously, where are all those mismatched baby socks I was hoarding?! This is an easy, inexpensive, eggcellent craft. My kids like using scrapbook paper because they enjoy picking out the paper. My son picked a sheet with pizza slices all over it because nothing says Easter like pizza. Using a template, trace at least four egg shapes onto paper and cut. Glue the egg halves onto each other. Fan out the egg and glue the last piece to the first. Hole punch or stick a threaded needle through the top of the egg. To make this craft more eggciting, cut and paste more shapes to make a fuller egg. To trick out the egg, add beads to a string and run it through the middle of the egg before pasting it together. You can also make a pretty sweet fireplace garland with these eggs. When brainstorming these Easter crafts, I didn’t have learning in mind. However, my son, learned quite a bit. From the suncatcher, he learned the terms “translucent” and “opaque.” From the bunny, he learned how to tie a knot, an important skill for a boy who’s eager to have laced shoes. From the egg, we went over the difference between 2D and 3D shapes. As for the tomb, he asked lots of questions, which included “How did He get out?” and “Who put Him there?” My son didn’t remember making the treat four years ago, which is surprising being that his sister wronged him so. I hope these Easter crafts are as educational for you and yours as they were for us. Happy Easter! After getting your Easter crafts ready, make plans to celebrate Easter at Chase Oaks. With 17 services at 5 different locations, we have an Easter celebration for everyone. We hope to see you there!